The UBC Sustainability Student Collective is a new campus-wide coalition of more than 12 student sustainability groups that came together to advocate for bold campus action on climate change and climate justice. The Collective has been fostering collaboration between groups and influencing the University’s strategic planning processes with the key message of inspiring UBC to lead the urgent fight for global climate solutions. 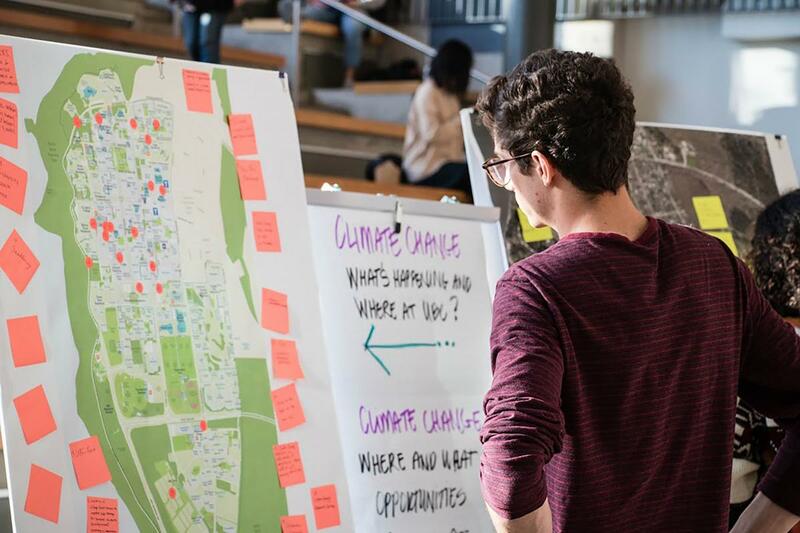 On Tuesday March 6th, the Collective invited students, staff, and faculty from across disciplines to take part in the UBC Climate Town Hall, and brainstorm creative strategies to springboard future campus climate action. More than 300 attendees engaged with topics like Voting and Civic Engagement, Curriculum, Divestment, Campus as a Living Lab 2.0, and the creation of a Climate Hub on Campus. 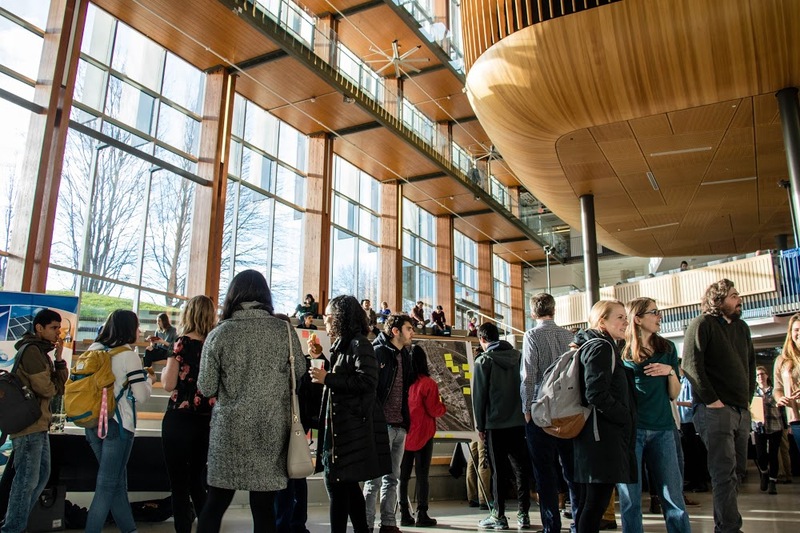 The UBC Community also participated in dialogue around these topics and their connection to climate justice at the Town Hall’s three breakout sessions. The events showcased how UBC efforts could go beyond just the local Campus level, and create tangible change through climate research, innovation and action. An asset-mapping piece graphically represented networks of sustainable initiatives on campus. It uncovered the ongoing interdisciplinary involvement across campus and is helping discover gaps in the network within operations, research, and the community itself. As a known leader on sustainability, UBC is uniquely situated to implement creative climate strategies. With support from the UBC Sustainability Initiative and UBC Campus + Community Planning, the Collective hosted the Town Hall to build off of the great work already being done on campus. The Climate Town Hall aimed to inspire the UBC community to take bold action with 3 driving climate themes: urgency, hope, and justice. Climate justice links the interconnected relationship between the fight against climate change and the fight for social justice. It safeguards the rights of the world’s most vulnerable and distributes the impacts of climate change equitably and fairly. There are clear disproportionate effects on the world’s most marginalized communities. “These communities will be most affected by climate change even though they’ve done the least to contribute to the problem and they’d also be the least equipped to be able to protect themselves against the threat of climate change” said Grace Nosok, a PhD law student, member of the Collective, and one of the organizers of the Climate Town Hall event. The Town Hall facilitated interdisciplinary discussions on integrating climate change and climate justice into curriculum. It facilitated discussions on the creation of a Climate Hub to enable and centralize collaboration between students, staff, and faculty on climate related initiatives, research, and projects. It set a challenge for other universities to hold their own student-driven climate town halls. It brought together a community empowered to face the threat of climate change and stand up for climate justice – to become global leaders. Join us. Together we can fight for a just and sustainable future. Alycia Doering is a member of the UBC Student Sustainability Collective, studying Real Estate and Urban Studies. She is a WorkLearn student at Campus + Community Planning, fascinated by urban innovation, and excited to immerse herself into European urbanism when she travels to the Netherlands for exchange in the fall!